Lake Bratan Bedugul, Bali - Indonesia, the second largest lake in Bali island where the Beratan Lake Temple (Pura Ulun Danu Bratan) is located. Lake Bratan (also called Beratan Lake or Danau Bratan) is located in the area of Bedugul, Candikuning village, Baturiti district, Tabanan regency Bali, approximately 55 km from Denpasar city, and it's located at an altitude ± 1240 m above sea level, the temperature in Lake Beratan area (Bedugul area) at night time ± 18° C and at daytime ± 24° C.
Lake Bratan is one of The World's 20 Most Beautiful Lake (source: www.huffingtonpost.com), it is very well known as the best tourist destination visited by many international and domestic travelers. 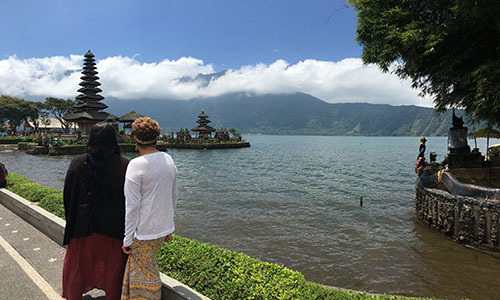 The coolness of the mountains with a stunning view of the lake, temple and mountains and away from the noise of the city so that this place is becoming a favorite tourist destination and recommended place that must be visited while enjoying a holiday in Bali. it's also facilitated with adequate accommodation such as hotels, villas, restaurants and water sport activities such as parasailing, canoeing, water skiing. On the east side of Beratan lake there is Mount Catur (Balinese people used to call it Pucak Mangu) which is a very nice place for hiking, and not far from the lake Bratan there are also attractive places of interest such as Bedugul Botanical Garden (Kebun Raya Eka Karya), Bedugul fruits and vegetables market and also lake Buyan and lake Tamblingan. Ulun Danu temple also called Pura Ulun Danu is located at the edge of lake Bratan, Ulun Danu temple built in the early 17th century, serves to adore the majesty of God in order to invoke the grace of fertility, prosperity, human well-being and for sustainability of the universe.